There will be just seven hours, 49 minutes and 41 seconds of daylight on 21 December, almost nine hours less than the year’s longest day in June. Stonehenge was built over 5,000 thousands years ago and remains a place of spiritual significance for many people. Crowds gather at the UNESCO World Heritage Site on the shortest and longest days of the year as the stones are aligned to the sunset of the winter solstice and the opposing sunrise of the summer solstice. Some experts believe the winter solstice was more important to our ancient ancestors than the summer solstice as the longest night marked a turning of the year as the days begin to grow longer. A Happy Winter Solstice to you all. Time to celebrate! It’s the shortest day of the year! Stonehenge is an ancient pre-historic site. It has been a place of worship and celebration at the time of the Winter Solstice since time immemorial. Respect the Stones and each other! Time to celebrate! It’s the shortest day of the year! Please visit the official English Heritage website for full details and respect the terms of entry. Please respect the Stones and each other! In ancient Pagan traditions, the winter solstice was a time to honor the cycles of life and death and celebrate the sun’s rebirth as the days would slowly begin to lengthen in the months leading into spring. Many modern practitioners of Pagan and earth-centered spiritual traditions observe the holiday, and at Stonehenge, the celebration is particularly special. Stonehenge, which celebrates its 30th year as a World Heritage site this year, is believed to be roughly 4,500 years old. Its significance as a link to British prehistory has drawn countless visitors over the years who come to gaze upon what’s considered to be the most architecturally advanced, prehistoric stone circle on the globe. Apart from its architectural significance, Stonehenge holds a place of sacred importance to many. Much of its history is still shrouded in mystery, though one thing that’s sure is that it was built upon a landscape that had long been used for religious purposes. The stones that make up the massive circle are thought to have been collected from distant places, some as far as 150 miles away, and brought to this particular location. They were then erected using sophisticated, interlocking joints ― but how exactly the builders accomplished these feats is unclear. Whatever its intended purpose, Stonehenge remains a place of wonder for thousands who visit the awe-inspiring structure every year. And its significance is especially potent at the winter solstice. In other words, on the two annual solstices ― summer and winter ― the sun respectively rises and sets in perfect alignment with the site’s massive stones. To witness the astronomical event, visitors typically arrive early in the morning on the day of the solstice to watch the sunrise and stay through to the sunset. 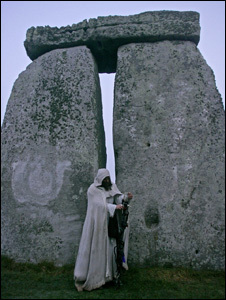 Local Druids host a ceremony during the day, as revelers and tourists alike bask in Stonehenge’s ancient atmosphere. Solstice Events are offering their usual Stonehenge Winter Solstice guided tour from London and Bath. … although it’s not clear whether these are stone masons or Freemasons. Clearly they were equipped with excellent quality chisels. Several of the Druid Orders that sprang up from the 18th Century onwards had Freemasonic roots – whether due to their founders being Freemasons or through the orders’ individual philosophies being quasi-masonic – and one was quite definitely and deliberately masonic in outlook. That was the Ancient and Archaeological Order of Druids, founded by Wentworth Little (a Freemason) in 1874, whose members all had to have achieved the degree of Master Mason and it was set up specifically to study the alleged links between Druidism and Freemasonry. Winston Churchill was initiated into this order in 1908 at Blenheim Palace. There are two notable Freemasons who’ve been part of the story of Stonehenge. The first is William Stukeley, the 18th Century Antiquarian who identified the Greater Cursus as a monument (and thought it was probably a Roman racecourse – hence the name he gave it). Stukeley is largely responsible for popularising the idea that Stonehenge is an ancient Druid temple. The second is Sir Cecil Chubb, who became a Mason in Salisbury at Lodge Elias de Derham, No. 586, on 26 October 1905. 10 years later he purchased Stonehenge at auction from the estate of the Antrobus family for the sum of £6,600, apparently on a whim (it’s said he went to the auction to buy some chairs). In 1918 he gifted Stonehenge and the surrounding 31 acres of downland to “the Nation” and was rewarded with a knighthood. Finally there’s a very obscure Stonehenge masonic link that involves Sir Laurence Washington, the great great great grandfather of the first President of the USA – renowned Mason, George Washington. There appears to be only a single source for this story – one Garry Denke – and if you Google his name you’ll find that his Stonehenge Armageddon Prospect campaign to dig up these relics from beneath the Heelstone has appeared on forums and mailing lists all over the Internet. Is Garry in possession of information known only to him and a shadowy conspiracy of hidden societies? Or is Stonehenge simply so ineffable that extra mysteries are constantly attracted to it? Was Sir Christopher Wren a mason and why he did he carve his name on Stonehenge ? Stonehenge Guided Tours offer exclusive inner circle tours giving you the opportunity to see the Stonehenge carvings with a guide close up. Are you a Freemason and can you share any information about Stonehenge and the Masonic connection? We would love to hear from you. When the media are looking for a soundbite from the rapidly growing pagan community in the UK, they invariably call Arthur and as a result the perception of many of the public is that he is the King of all the Druids. This tends to annoy some other people in the pagan and Druid community who resent the implication that Arthur speaks for all of them. Arthur, however, doesn’t claim this for himself. What Arthur does believe is that he’s the modern reincarnation of the archetypal King Arthur of legend – returned to do battle for Truth, Honour and Justice in Britain’s hour of need. In 1986 he changed his name from John Rothwell (ex biker and ex Army serviceman) by deed poll and he is unique in that his passport – in the name of Arthur Uther Pendragon – shows him wearing his crown. The sword that he carries – Excalibur, naturally – is one of the originals made for the film of the same name. Its previous owner initially refused to part with it, on the basis that he’d only sell if the real King Arthur showed up to claim it. Arthur promptly presented his passport, much to the surprise of the owner! His life story is too involved and full of startling magical coincidence to go into here but his biography “The Trials of Arthur” (C. J. Stone and A. U. Pendragon, Element Books, 2003) is worth reading if you want to better understand the man and his motivation. After the government shut down the Stonehenge Free Festival with the infamous and appalling police violence of the Battle of the Beanfield in 1985, an exclusion zone was established around Stonehenge for the Summer Solstice complete with roadblocks, razor wire, helicopters, horses and dogs. Years of conflict between the festival community and the authorities followed. Arthur was a key figure in the campaign to re-open Stonehenge to celebrants and eventually took the government to the European Court in 1998, claiming that the exclusion zone breached his freedom of thought, conscience, religion and freedom of expression, in contravention of Articles 9, 10 and 11 of the European Convention on Human Rights. The exclusion zone was lifted in 1999 and in 2000 the first of the Summer Solstice Managed Open Access events took place, with around 5000 people attending a celebration through the night in pouring rain. These open accesses have continued ever since at Solstices and Equinoxes and it is doubtful that they would have ever begun if not for the campaigning of Arthur and others. In the great British tradition of eccentrics, Arthur stands out proudly – he is the grit in the oyster, a thorn in the side of bureaucracy and passionate about the causes he champions. You may or may not agree with him, you may like or dislike him, but you can’t deny that he gets out there and tries to change things in the face of almost overwhelming odds. Without him the world would be a much less colourful place – as a nation, we could do with more of his kind.